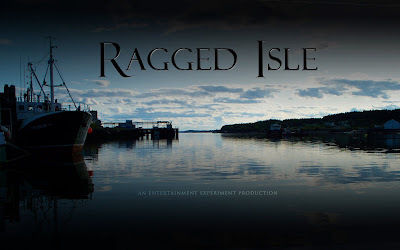 Show your Ragged Isle pride! When I taught writing, I used to share with my students a story about the painter Cézanne. I can't remember where I first heard this story, and it may or may not be true, but it's the kind of thing that, if it isn't true, should be. Cézanne, the story goes, used to sell paintings to his friends in order to have money for food and rent. But after the paintings were gone from his studio and hanging on his friends' walls, Cézanne would continue to think about them, cursing himself for what he perceived as imperfections. So, late at night, he would break into his friends' houses and make tiny changes to his work. His friends would wake up in the morning, smell fresh paint, and know that Cézanne had been there. As a writer, I can identify. Every time I finished writing an episode of "Ragged Isle," I would have about 15 minutes of enjoying that sense of completion, of believing that the episode was truly done. But after those 15 minutes were up, I'd start thinking of ways to make the episode better. Thus, the revisions would begin. Since "Ragged Isle" is a collaborative project, it wasn't just me thinking of ways to make the episode better -- it was four other people as well. Barry or Karen or Rick or Jake would have criticisms, ideas, suggestions -- all leading to more revisions. Of course, anytime anybody else makes a suggestion, I have that initial lizard-brain flash of resistance: Why should we change that? That part's perfect! But then the more rational side of my brain would kick in and I'd realize they were right. Back to revising. Some episodes of "Ragged Isle" went through 10, 15, 20 revisions -- everyone working hard to make it the best possible episode. Not every revision was extensive, but I do believe that every revision made things better. And after every revision, I got to enjoy about 15 minutes of thinking that this time, we'd really nailed it. The episode was done. But the truth is that the episodes will never be done. There will be changes right up until shooting day, and then more on the set and even more in the editing room. And even after we release the finished episodes into the wild of the Internet, I'm sure we'll all continue to think of ways each of the episodes could be a little better. But I promise not to sneak into your house and upload new edits to your computer. That would just be creepy. We are in the process of selecting and securing locations. Maine has such a wealth of choices that it makes just selecting them difficult let alone securing them, which is an exercise in patience. The latest acquisition is my father's boat and dock so that is very cool. It's a bit of a hike from here but the freedom this will allow is real helpful. There is still much work to be done but that is probably because we have about 20 locations. I can say that we have more secured than not so I'll take it.